Are the music and icon familiar to you? Congratulations! You are in line with millions of players around the world. Digital games have become increasingly popular among the young generation these days. Integrating L2 gaming into foreign language learning has aroused public interest and provoked discussion among educationalists and gamers. Although L2 digital games are primarily for personal pleasure, gameplay enhancement has been viewed as the major driving force for gamers to learn a foreign language during gaming. Chik (2014) explores how gamers exercise autonomy in the community through games for both pleasure and language learning. She discusses the affordances and limitations of digital gaming in terms of five dimensions: location, formality, pedagogy, locus of control and trajectory. 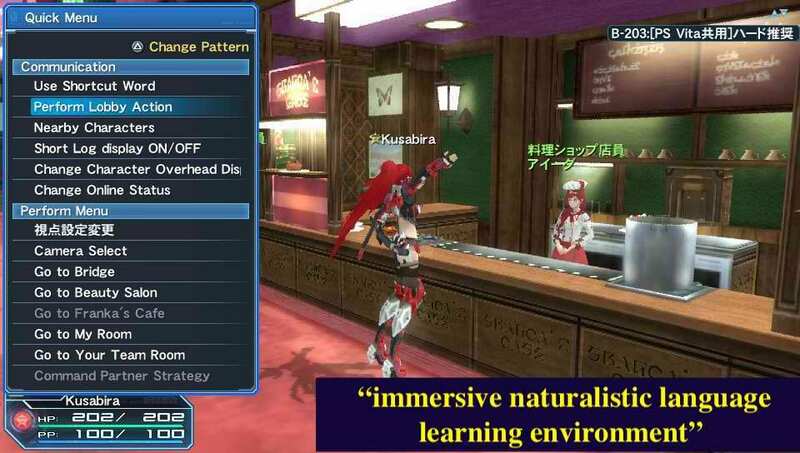 The location of L2 gaming activities can be both physical and virtual, creating an immersive naturalistic learning environment for gamers, as presented in Figure 1. For instance, players can interact with other gamers or produce paratexts in both online and offline communities (e.g. the student hall and relevant blogs). Learning L2 through digital games requires gamers to shift from incidental learning into intentional learning. If they consciously apply their learning strategies into L2 learning in a gaming context, the learning process can be considered intentional, which supplements formal learning. Digital gaming can provide not only textual and social interaction but also prompt gamers to play an instructional and advisory role. For example, experienced gamers usually inform beginners of both gaming strategies and specialized in-game vocabulary within online or offline communities. Although digital gaming offers unstructured texts, gamers should be aware of the pedagogical potential of in-game texts and be encouraged to play the L2 editions. Locus of control refers to whether language learning is self-directed or other-directed. Self-directed gamers tend to make their gaming and learning decisions according to their personal goals and interests, while other-directed players are inclined to accepting the suggestions provided by gaming communities. This implies that gamers are capable of controlling the balance between their initiative choices and communal advice. For example, we can learn from Figure 2 that gamers could determine to play the official version through learning English by themselves, which is also a good investment to them. Trajectory means managing gaming and learning in the long term, which can be caused by making progression in a game series, choosing a preferred gaming language, and playing various games of different genres or different games of the same genre. L2 learning through digital gaming is not limited to interaction with other gamers. It can also motivate gamers to learn L2 autonomously for a variety of purposes, including maintaining a friendship with foreign gamers, achieving victory in games as well as enhancing foreign language skills. Based on Chik (2014) and our discussion, L2 gaming provides both affordances and limitations for L2 learners. When playing L2 games, gamers immerse themselves in L2 environments, which offers them rich learning materials and opportunities to practice (e.g. interaction through in-game texts with other gamers). However, whether gamers can learn L2 from gaming depends on the degree in which they learn the language in gameplay intentionally. L2 learners expose themselves to abundant game-related learning materials, including L2 in-game texts, oral interactions with other players and paratexts about the game on relevant forums and blogs. Hence it helps gamers to improve their vocabulary, reading comprehension, and speaking proficiency. If the gamer has a good command of the foreign language in the game, he or she can further improve their language skills by posting the translated in-game texts on forums to help other players. If the gamer is highly interested in some characters in the game, he or she can write fanfiction and spread it as a fandom. They may also receive corrective feedbacks and inspiring comments from the communities. Playing L2 games may motivate students to work harder at school because they find that second language learning at school helps advance their game-play. Gamers have access to the foreign language through their game console anytime anywhere, which is rather convenient for learning. Acquiring a foreign language in digital gaming can bring gamers much more pleasure and positive energy compared to institutionalized textbooks. It would be difficult for novice L2 learners to use L2 gaming independently, not to mention to learn from it. Texts in L2 gaming are unstructured learning materials and some jargon in the texts may not be suitable for everyday use. The contents of the L2 games are relatively restricted and highly specialized, based on gamers’ own preferences. It is worth noting that the freedom to choose games may lead to inappropriate entries (e.g. violent games) as the L2 learning through gaming takes place “in the digital wilds” (Reinhardt & Sykes, 2012, p.33). Gamers are likely to get addicted to the digital world, thereby spending too much time on gaming. Too much gameplay may have a negative influence on their health, such as poor eyesight. It is hard for learners to balance gaming enjoyment and language learning, especially for young gamers who lack self-control. If gamers do not own the intention and autonomy, they may forget about learning and focus solely on the fun of playing a digital game. To sum up, digital gaming has its potential to promote language learning, but the key lies in that gamers need to practice their autonomy and turn incidental learning into intentional learning. Since the game is over, here are some questions we want to discuss with you. You are very welcome to respond to any, and we’ll be happy to give you a reply. Have you ever learned a foreign language through L2 gaming? How effective was that? If 1 is ineffective, and 10 is perfect for language learning, how would you rate this approach? Why? Have you ever integrated digital gaming into your class? If not, will you apply them to your teaching in the future? And how? Do you have any thoughts about how gamers exercise autonomy to keep a good balance between playing and learning? Thanks for your sharing. I never learn a foreign language through gaming, but it reminds me of my niece who once did that. My niece, a 3 years old girl, is quite assessed with a game. In the game, she has to fill in the blank and completes the words, which of course she is able to learn vocabularies in that process. But I think she is into the game only because she loves the music in that game but not because she wants to learn words. Also, I think it is not an effective way to learn English. Take my niece as example, she spends an afternoon to play the game, but maybe she can only learn few words. That is my opinion, thanks. Indeed, young kids are more likely to get addicted to the games. At this stage, she might need an instructor, like her family, to help her learn words intentionally and also have great fun. And then the process she learned these words was pleasant and could encourage her to memorise the spelling. I played online Catan with my classmates when I was in high school,which was designed to fulfill the task by building ports,houses and earning different sources as many as possible. From this game, I learned vocabulary about natural sources, game process and system feedback, such as compliment and negative comments. 5 could be fair to this game, because it is a little bit too easy and repeated.But it is useful to make players memorize the words in a long term. I have not intergrated digital gaming into my class, but I will in the future. Most of the children and teenagers love online games, and it is a win-win situation if they play the games I recommend to improve their language skills in their spare time. They will be motivated. The games I choose to guide them need to be related to their language level, and I can be part of the multiplayer games to ensure that they are learning. Evelyn, thank you for sharing!! I also think that learning language through games can help motivate some language learners. Chik believes that the intentionality of learning is crucial to learn language from gameplay. Did you intentionally learn the language when you play the game? Though I think gameplay as a supplementary way to learn or practice, can benefit language learners even when they do not do any intentional learning in gameplay. As you have mentioned, some words or sentences frequently appear in particular context in the game, and maybe the learner can guess the meanings and learn the language without intentional learning. I have never learned a foreign language through L2 gaming but my husband did it when he was young. He liked to play some games which were just supported by American server at the beginning only e.g. League of Legends. In order to have good performance in the battles, he tried very hard to read the background information about the game, communicate with the foreign players in the game and exchange their experience and tips with each other in chat rooms. He said he would rate the effectiveness as 7. The first reason is that it makes him bolder and more confident to use English no matter at school or in the game as he thought that even native speakers could understand him well! The second reason is that it can sketch his potentials of using English to a large extent. My husband was a quiet teenager who did not make very prompt response to others. But when there is emergency during the battle, he would suddenly feel energetic and start to produce a lot of sentences / phrases to other teammates in order to save their team. As mentioned in my precious comment, I have asked my students to play Cooking Mama at home and then required them to write a recipe based on how they cooked in the game. They were really motivated, engaged and willing to express their dishes and recipes in English. I think teachers and parents can encourage their kids to record how many hours they have used for playing and learning with electronic devices. Then, we should discuss with them to evaluate whether it is a good balance or not. Making self-evaluation is a good way to develop learners’ autonomy. P.S. Many parents complained to me that their kids just played with mobile phones at home and did not read textbooks. They thought their kids were extremely lazy and addicted to mobile phone games only. For students, they explained to me that sometimes they really used mobile phones to look for information to finish their homework or watch football match online in English. They thought it is also a kind of learning. I can see a huge generation gap in between. What do you think? If you were me, what would you do or how would you explain to the parents? I have been annoyed by this kind of complaint for many years. >.<"""
It seems a misunderstanding between kids and parents. One of the ways is to ask kids to do information searching and learning English through mobile phones with their parents. This may get parents understood what their kid(s) do with mobile phones is for learning purpose(s). Ivory, thank you so much for your detailed comments! I should say that your husband’s case is really a good example for combining digital game and language learning together. The gameplay helps him become more confident and motivated to speak out. As for your questions, if I were you, I may advise the students and their parents to do some learning together online, such as watching matches in English or utilizing some language learning websites. During this process, parents can guide their children to find the enjoyment and also the right ways of learning. Students can also show their own efforts of learning through mobile phones to their parents. Working parents actually spare little time with their children these days and they are likely to misunderstand their children about using digital devices. This method may reduce their misunderstandings to some extent and also enhance their relationship as well. In terms of the first question, I will rate L2 gaming for learning the language as 7. In terms of its advantages, it can provide many game-related learning materials, and the game is more interesting than traditional teaching methods, in this way, it can arise the willingness of second language learning. However, just like the post says: Gamers are likely to get addicted to the digital world, it is hard to balance the time spending on game enjoyment and language learning. Therefore, I prefer to learn L2 by game properly and I think it is not that perfect, but it is also practicable. And in terms of keeping the balance between playing and learning, I think it is important to supervise the time spending on the game, which requests the cooperation of teachers and students’ parents. Hi, Emma. I agree with you that learning through playing games is not perfect, but practical. Actually, it reminds me of the book I read, in which it says that a well-designed game can create immersive environments for gamers. They can not only enjoy the game but in the visual world, gamers can develop problem-solving abilities, learn social skills and collaboration. And these are actually capacities required by the digital age. This point might lead to the answer to the last question. If teachers can help to improve students’ awareness of the potential benefits of gaming, students might be able to treat games differently. In other words, maybe students can exercise autonomy better if they know what they can learn during the process of playing games. Hi, Emma. Thank you for sharing. I also agree with you that the L2 games can offer a large number of l2 resources to language learners. Though the materials are usually not structured, they often appear within a particular context, which can help players to understand and learn the materials. I also think that those with a lower level of self-discipline should play games under the supervision of others, and it is also important to improve their learning intentionality in gameplay so that the learners can learn more about language from it. Actually, when I was in primary school, I played games in “Kingsoft TypeEasy Game”. One of the games was to help frogs crossing the river. I had to type the words that showing on the leaf. Once I typed correctly, the frog could jump onto the certain leaf and I should type other words before the leaf floating away. The vocabulary could be set in different levels. It did help me to learn some new words and remember their spelling. But the game was a bit boring after playing it for many times and the language input was quite limited. So, I might only mark 4 for this game as it is not very effective for language learning. I haven’t integrated digital gaming in my class, but I will in the future. I think digital games could easily attract students’ interests and give them a more relaxing environment for language learning. But I would not use it as a main tool because it is hard to control their learning process and outcomes. It might be better if teachers and parents could cooperate in using digital gaming for language learning after class. Hi, Jennifer. I have also played the game when I was young, but I didn’t learn much about language from it as I only focus on typing. I think it is kind of an educational game, which actually offered lots of L2 materials like vocabulary and some short stories. But it is difficult for very beginners to learn from if they don’t have high learning intentionality, like me, and meanwhile, it is too easy and boring for mediate learners and advanced learners. Therefore, it is crucial to choose appropriate games for language learners at different levels. Jennifer, thank you for sharing the game and your learning experiences. I agree with you that gamers may feel bored after playing the same game for many times. In this case, as we mentioned in this post, gamers could consider playing different games of the same genre or different gamers of various genres. Perhaps, they could learn something new from new games. Hi, Jennifer. I also played that game when I was in primary school! It seems that all the games set in that software aimed to test learner’s familiarity with word spelling. It gave me the word and I need to type it as quickly as possible. Since its vocabulary is also limited, I think the game is meaningless and boring after playing for several times. Anyway it still left a deep impression on me because I didn’t learn language through other digital games haha. I have never learned a language through gaming. However, a friend of mine is crazy about digital games. He is the most successful case of L2 acquisition by playing games among the people I have met. As he mentioned, digital gaming plays an irreplaceable role in his English learning. For Example, mobile strategic role-playing games like Fire Emblem Heroes requires a thorough understanding of different skills. The English version of walkthroughs for such things is mandatory for players. He also gave an example of action role-playing games on PS4 such as Kingdom Hearts 3. Cinematic cutscenes with voice acting in English offer him chances to listen to the pronunciation of words/sentences. Walkthroughs in English allow him to keep upgrading his English standard because it is impossible to proceed without a thorough understanding of the plot in English. He said it is the most effective way for him to learn English. He is willing to let himself to immerse in English because digital gaming has been providing so much fun to him. Hi, Fannie. I also think that the interest in playing L2 games and desires for advancement in the games can be a motivation for gamers to learn the language. My cousin also learns Japanese by playing games. 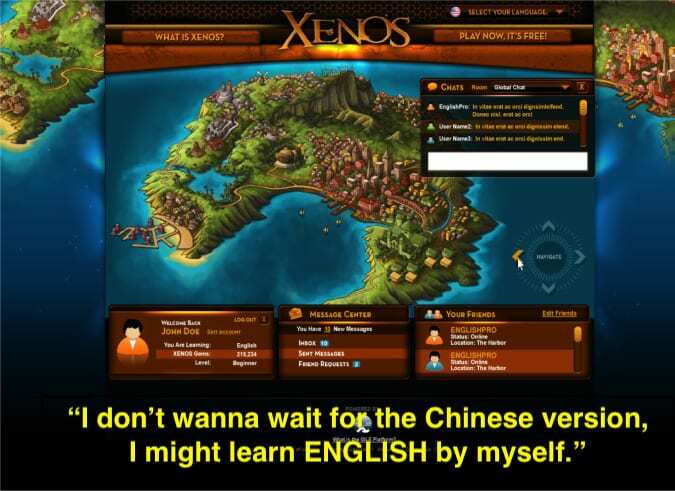 But maybe it is not an effective or suitable way for everyone to learn a second language in gameplay because some gamers can actually play l2 games without knowing much about the language by searching for help from the gamer community, and some may only be passively exposed to the language without any intentional learning like looking up the new words in dictionaries. The gamers need to be interested in both the language and the games so as to make gameplay an effective way to learn a language. Acturally I can just remember a digital game in which learners can practice spelling of English words. To be specific, learners act as policemen, and they can catch the thief who is running away when they can spell the English words correctly. I think it is an interesting way for students in the primary school to recognize and memorize some English words. If the target learners are at younger age, I may rate 9. However, 4 will be rated for being used in high school students’ language learning. Because the teaching approach should be conducted with considering age of students and their interest in what kinds of digital games at the specific age. I have not combined digital gaming with my teaching. But I consider it can be applicable if suitable games can be found to develop students’ language learning. In my opinion, asking students to share their own experience of playing digital games can facilitate their communication in target language in classes. I suggest controlling time and exercising some required tasks for students to accomplish may contribute to their self-management of playing and learning. Hi Mandy, the game you mentioned sounds interesting. I think it may be useful for primary school students to learn English words. Could you share the name of this game? I agree with you that factors such as learners’ age and interest as well as time spent on digital games should be taken into consideration. It is actually a game included in a series of Jinshan Typing Game. It is named “Speed ​​of life and death”. Yes, I think highly of applying digital activities according to students’ age because our aim is to activate them and match their interest so that they can be more motivated through English learning. This game is only suitable for younger learners like those in primary school. Thanks for your sharing! The first answer will be No. Well, I played digital games but seldom I will pay much attention to each words of the game. The language used in a game shall be simple, once its targerted audience is from different levels. As I already have accumulated much, the game words won’t work for me. But I think it may be useful for beginners to learn from game. Every hint or instruction will leave a impression for beginners. More time on gaming, they will be more familiar with the meaning and usage of vocabulary occurred in th game. I have played Farm Together when it has not released a Chinese version. Though my intention was not to learn language through the game I have learned many words about constructing a house and gardening. I think it is quite useful as a vocabulary enhancing tool. And it also has a communication section where you can talk to your virtual neighbors. My neighbor is a French man, we use English to talk, I think in the process of negotiating meaning both of us have improved a lot since then. I have not had a job in 24 years of my job….. QʌQ. But I would use it in my class if I can be so lucky and find a job last month. I think use gaming as a pre-class activity and homework would really be a good idea among all age range. Ask the students to play games which is topic related will create a bridge between their in-class learning and outside world Also it will make preparation for class more desirable. I actually do not have any advice for the balance, because I am quite addicted to the game myself. Though I have learned words and how to communicate I have also spent a lot of time in building my garden and cultivate the vegetables. I would like to see the amazing ideas shared by others. !! Thank you for sharing. I haven’t had such an interesting language learning experience through digital gaming like yours. To be honest, I’m not into digital games. I prefer watching movies and TV series.🤣 But I’d like to know some games shared by you guys, and I think I’ll try some in my spare time. Good luck with your job hunting! Hope you can combine digital gaming with teaching successfully! Firstly thanks for your amazing sharing, and the music of Supermario at the beginning just reminds me of my childhood coz I used to be addicted to this game when I was in primary school. In terms of the 2nd question, my answer is yes. When I was an English teacher in XDF(New Oriental Education and Technology Group), I’ve used games to facilitate my students’ language learning to some degree. My students are primary school students aged from 6 to 13 years old. Basically they learn words, simple word collocations and sentence in every class. In our department, all the classroom for primary school students are installed with IWB(interactive whiteboard). Children can use their fingers to do exercise,practice, as well as playing games on it. For example, in my class, I divide my students into two groups, which represent teamA and teamB seperately. Then two teams compete in a game, and the winner will be the team that gets to the destination first. In the process of the game, they’ll come across different words or questions that are learned in that class, and if they choose the right answer on the whiteboard, they’ll move one step forward. Actually this game can be used as a kind of summary to review the content learned at that class. It turns out that all of my students like this kind of competing games very much, and even students who aren’t active in class will take an active part in this game. They make great progress in the gaming community. Thus from the perspective of students’ antonomy, gaming community is a great help for them to promote self-motivation. Fay, thank you for your comments! I think your sharing is a good example which intergrates digital gaming into language teaching successfully. The group activities you designed not only motivates students to learn but also foster a sense of community among group members. Thanks for sharing. I once used a website to study Spanish. The games there were very interesting. I had to remember the words and phrases and put them in the blanks so that the “map” could be completed, I could go to the next destination and find the “treasure”. It was attractive and effective at first since the words and phrases were easy. But then, complex words and sentences were introduced. I could guess some answers correctly, while it was hard for me to understand the meanings. So I stopped playing the games there. I would rate this approach a 6. I think it is effective at first, helping me gain the basic knowledge and set foundations. Also, I was motivated at first. But when it turns to medium and high level, the games are not that charming and effective. I integrated digital gaming in teaching the students, especially learning vocabulary. I would introduce some matching games to help the students remember and understand the new words. As for other aspects, whether to use gaming depends on the learning objectives and needs. In a whole, I think gaming does help language learning. But we should take it into full consideration. Hi, Moon. Thank you for sharing your learning experience. I also think that it is a problem that the materials offered by most games are not structured or not that carefully and appropriately designed, which may make the leaners abandoned the games. Therefore, I think it is difficult for learners to learn a language only from games, but as a supplementary way to learn a language, l2 games do have lots of affordance. I have never learnt a foreign language through L2 learning. I don’t believe that it is a good and effective in learning a language. Personally, i will not use gaming to learn a new language if I don’t have any basic knowledge about the language. However, I admit that it is a good way to motivate students’ learning. It attracts student’s attention and arose their interest. It not only provides a platform for them to practice their language, but also enhances their knowledge outside classroom. In fact, it is quite difficult to rate the gaming approach. It also depends on which level you want the learners to achieve and their age. If the learners are just kids and you only aim at learning vocabulary, I think the apps and games nowadays can definitely fulfill the learning goal. Then I will rate it as 8. If it is for teenagers and adults, the rating will be lower. As you have mentioned in your post, the contents of L2 games are relatively restricted and highly specialized. Gladys, thank you for your comments! There are indeed some limitations of digital gaming for learning language, like restricted contents. And also if the description are too complex for gamers which consist of difficult grammar and words, it would be unlikely for new language beginners to play. So for teenagers and adults, the choice of games would be very important and their interest in the digital gaming should be a prerequisite for learning. To be honest, I have never learnt a foreign language through L2 gaming but I saw some affordances of digital gaming in English learning from my students. One of my students was in middle school and the time when I was teaching him the words about polygon, I showed him pictures and taught him how to memorize the words “triangle” “quadrangle” and “pentagon” since the prefixs are from multiples “triple” “quadra” and “penta”. At that moment, he told me that he had learned these three words from the game named “ King Glory”. When he slained enemies there would be system sound that “first blood” “double kill” “triple kill” “quadra kill” and “penta kill”, he inferred the meanings of these words by the gaming context and memorized these words. Although this student got some benefits of learning vocabulary from digital games, he always spent a lot of time playing the games, which I think it is giving a lark to catch the kite. So I may rate 4 for the effectiveness of L2 gaming in language learning for some students who are addicted in playing games. Charlene, thank you so much for your comments! Undoubtedly, students are likely to be addicted to playing digital games and forget their learning purpose. In this case, do you have some suggestions for both parents and teachers to help them practice their autonomy and learn language spontaneously? Thanks for your sharing! I’m really interested about digital games in L2 learning, cause actually I believe that learning through a game is really an effective way especially for those low-level learners or novice as games can to a great extent motivate students’ interest in learning. I use a lot of game in my class for those primary school students but for digital games, it is really a new field for me. Actually, I think that there’s a lot of limitations and burdens to use digital games. Firstly, teachers should find a suitable game for students to play in. Secondly, it is teachers’ duty not let students be assessed in games because internet addiction among teenagers is really a social problem which many parents are afraid to face. In my opinion, some simple digital games can be used as a supplementary tool or like an assignment for students to complete after class, which can help to deepen their learning. Maybe some spelling games. Jean, thank you for your comments! Well, I never learn language through playing digital games. But I notice my little brother who loves playing computer games. I don’t remember the names of games, but they are in English version, whose background music are English. After playing that games, I sometimes hear my brother saying ”fire” or “K.O.” , and something like that. But his main purpose is for pleasure, not for education. The vocabulary and sentences he learnt from the games are quite violent and not suitable for daily use. I think it’s hard to make learners to balance the entertainment and eduction,especially students who are lack of self-discipline. In addition, it’s also hard to let learners truly learn something from the games. You are definitely right about the language your brother learned in game. And the language use in game are sometimes rude, because the players keep swearing. Actually, I don’t have an experience of learning languages through L2 gaming. But if I have an opportunity, I do want to try it to see its effectiveness for language improvement. As an English teacher in digital world, I would like to apply digital games into my teaching. As for me, I would try handing out the materials relating to digital games to let students immerse into the gaming context in advance. Then, I would use task-based teaching method to implement some activities in digital games of different levels according to the students’ actual English levels. In this way, students would be get bored and can achieve improvement themselves. As for the third question, in my viewpoint, I think the game designers could shoulder its responsibility to help exercise autonomy for gamers. For example, gamers need to log in with their ID number. And the system could automatically identify whether they are the teenagers under 18. If they are under 18, game designers should set the boundaries for them to play everyday with limited hours. Yasmine, thank you so much for your nice comments! I think your ideas really make sense. Setting limited hours per day for teenagers under 18 is a useful rule. Every time my brother play PUBG, he could only play 2 hours each day due to the regulations. This can help him discipline himself and also gain some enjoyment. Yes. But it does also give rise to the other problem for digital games developer. They maybe reluctant to set up this regulation because of the profits, so I suppose related department should build up the laws to regulate the digital games. Thank you for your excellent sharing! The combination of game music and its icons are really interesting👏 Honestly speaking, I have no passion for computer games at all (sounds quite old-school😳) but I do love the crossword puzzle🔍! I used to play it on my phone. In my opinion, it can help learners accumulate more vocabulary and build confidence when they accomplish a particular task. Nevertheless, whether the learners sustain interest in this unconscious learning activity might be a problem. b) language learners may benefit a lot from the video games supported by virtual reality technology in the future because they will be able to truly immerse themselves in the target language environment and interact with native speakers as they do in the real world. Your comment reminded me of the movie Ready Player One, which I actually thought about it yesterday when I was wondering if we really can engage in virtual gaming in that way as truly immersed into the gaming world and associate with gamer from all over the world. If we are fortunate and live to see that happen, I would definitely recommend my students to engage with that gaming world, because I was really inspired by the story of Almon(if you remember him) who actually build confidence of learning English through engaging with other English speakers sharing common hobbits. So, why not gaming? I have learned English through a game called “Kingsoft TypeEasy Game”, as mentioned above by Jennifer. It’s very useful in helping me remember some English words unconsciously. Also, it aroused my interests in learning English as it provided me with a platform. But I don’t think I’ll involve games into my classes in the future, because most students tend to be addicted to games. Also, most of the games have limited effect on language learning. So maybe learning through games could be encouraged to people with self-control. I like that word “LIMITED”. Also true to me. I found that I’m just not into playing games. or it could be that I didn’t find the right game to play. Unfortunately I have never learned English through gaming which I regretted a lot since I read your blog and Alice’s research. My father taught me how to play Command & Conquer: Red Alert when I was in primary school. But according to my memory, I listened to the words, instructions and background introductions before each mission, but it never occurred to me that I should look them up in the dictionary. I just memorized the icons and relevant constructions linked to it.Such a pity! In the meantime, it occurred to me that I assume that majority of gamers may share my gaming experience. They were totally immersed into the L2 context but never thought to learn from it. As to the second question, I think I will rate 7.5 for learning through game. Personally speaking, I think, as Alice said in her research, motivation was the best teacher for teaching and self-learning can be really effective and productive. We only have to find the best way to utilize it. In terms of the third question, I think if the game is designed for educational purpose, there should be no worries about the balance between learning and playing because students will constantly learn as long as they play this educational game. Instead of making great effort on students’ autonomy, teachers and game programmers can spend more time on how to work out a game that combines learning and playing in a better way. Indeed! That’s why we need more fun educational games. I do hope that one day we Chinese English teachers can choose from a large amount of games to use in class and that would be a totally different way of learning. Thanks for your wonderful sharing. Personally, I never learned language through gaming intentionally, but I have to admit that I’ve acquired some words and expressions from either the game itself or the gaming community. Some good players would share their experience and strategies to on-line communities just as you described, which I think it’s a useful way to obtain both communicative competence and discourse competence, and I think to some extent, those authentic practices should be supplementary activities to rigid linguistic knowledge which taught in class. But the thing is only very limited part of young people have the awareness to read the original English-presented information in real life , most of them choose to find the translation of their own first language. So I think how to raise their awareness of learning English while playing digital games is a tricky issue. I tried to talk to my students, and one boy told me that the only reason he’s playing a game is searching leisure and fun, and clearly, playing with an intention to learn English will leave him nothing but boredom. Hi Zoe~ I think I have the same opinion with you that I don’t learn English consciously when I am playing online games in English but acquire new vocabulary and sentence structures. I used to play Final Fantasy. In this video game, there’s a video serving as background knowledge about the story before I am designated to finish a task. There are always conversations between animated characters in the video. I acquire new vocabulary when I hear it and at the same time see it, which makes me acquire it unconsciously and surprisingly the memory remains fresh till now. So I think if teachers are supposed to be aware of the magic of gaming to students and guide students to acquire more and play with intention because I think the low affective filter of gaming could make the learning more effective. Thanks for your idea! This reminds me of a certain question when applying these video games to English teaching, that is to what extent can a teacher obtain the “magic of gaming” as you mentioned. I mean if the teacher feels unpassionate for this game, would the effect of this teaching approach be reduced? So maybe, how to intrigue students passion towards a game is also important hhh. Thanks for your sharing! The only time that I used game to learn language was on our literacy class. 😄 That particular lecture really opened a new world for me as an English teacher. I found it a very interesting way to learn a second language, so I will definitely try it in my own language class. The limitation mentioned in the article is also what I’m worrying about. What if students use ‘learning language’ as an excuse to ask for more playing hours? How to facilitate learners’ autonomy is really a critical question in adpoting digital gaming in second language learning. I would like to read the comments of our classmates and hear from your opinions. I guess language learning through game play is mostly incidental, so it is difficult for everyone to find just the right game of the right second language level without losing the fun of playing games. So i don’t think we can expect students’ autonomy to play a big role in learning through game play. Thank you for your interesting sharing!! Personally, I didn’t try to learn English through playing games intentionally, but I did learn some expressions in the process. I think the efficiency of learning language through games depend on various factors, such as the game design and learner’s objectives. For example, if a game is not designed for educational purpose, it may pay less attention to the accuracy of language used in the game. So there may be some spelling errors or some “fake” conversation that may not happen in reality. However, playing game is a good way to arouse students’ interest and it should be interesting to introduce some games into teaching procedures. When students learn how to describe a place, they may learn some language patterns by looking at a map in a game. Also, as a game usually has many scenes, students can have various mental representation of different places or situations when they are doing a writing task. I would like to hear more about the application of games from you. oh, there’s this game called Quest Atlantis, it is both educational and fun to play, but it is aimed for 9-12 year olds in North America. So I doubt whether Chinese users can have access to it or whether the content and complexity is suitable for English as a Second Language learning. Thanks for your guys’ work. Gaming learning is really an exciting topic in the L2 learning process. I do believe teachers and learners would all hope teaching and learning can be like playing games, and the teaching targets and learning achievement can reach their goal simultaneously. If learners can become game addicts, they would also be able to learn automatically. Then teachers and parents might be much happier. But there is a question of whether learners can really acquire the knowledge in the gaming process. Real acquisition cannot occur unless learners notice and comprehend what they are receiving. Because learning involves many unpredictable aspects, gaming might be one of the teaching activities to help learners practice what they have learned a mimic setting, which is more interesting instead of some tedious assignments. I never try to apply games into my study and teaching. One reason is that it is less easy to find appropriate sources, on the other hand, choosing the right gaming with expectable achievement in teaching needs considering very subtle details according to the teaching content and all participants’ backdrops. But as a new trend of learning from gaming exercise, I am really willing to have a try and share my experience. Can’t agree more about “can not finding appropriate game for learning”. I also tried, but failed. Sometimes it’s because I’m not interested in that theme of game, or there’s nothing much to learn, or it could be too difficult to progress. The question is that most of schools still prefer traditional way of L2 learning in classroom, and digital games are somehow regarded as something which are not beneficial for education because learners may be absorbed in these games. So learner’s autonomy is very important in learning within games. We definitely can learn some new vocabulary naturally if we play L2 version games, but we have to figure out whether the main purpose is leisure-centered or learning-centered. As for me, I believe that it is a nice try to apply this new context in my future teaching for internet has already emerged in our daily lives and most importantly, students motivation will be enhanced and learning skills can be improved. Well, let’s just hope that one day there will be really excellent educational games available and then we teacher can have easily make use of them. Thank you for your sharing i love it. I have never learnt a foreign language through online games but i have tried it several times with my young learner students- 4-5years old. It is normal that kids found it’s difficult to concentrate in the class so I turn on the computer and download a game called “counting fish” to practice target vocabulary “numbers”. My students immediately became super active and the speed they captured 1-10 numbers was faster than the class which didn’t play this game. After that experience, I started to use games to teach phonics. kids were so attractive by those cute little monsters who pronounce sounds. Therefore, I recommended this as a way of reviewing at home for their parents. BTW, this is the game website http://www.abcya.com/ . Thank you for sharing this lovely website! It is a definitely a useful resource for everyone. I’ve never taught such young kids. It must be a challenge for me to let them focus on my teaching. Great to receive your sharing and know that the game works. Thank you for your sharing. I really like the format of your blog. And honestly, I am not a fan of digital games. But I’ve got many students who are reallly into playing games. Sometimes, they teach me some new words like “pentakill” which they learn from the games they play. And I get it that people really learn from playing games. But I think it is difficult for learners to apply what they learn from games into real context. I’ve learned L2 from SIMS.I played this game when I was at secondary school and I needed follow the English instruction to create a character. At that time, I only obtained some basic skills in English and it was hard for me to fully understand all the words in that game. Therefore, sometime I needed to guess the meaning and click on different items to get the English name of them. This game was created based on our daily life and I could know some daily-used language and accumulated some words that I didn’t know before. Therefore, I consider that the games liked SIMS could help L2 learning especially for the beginners.